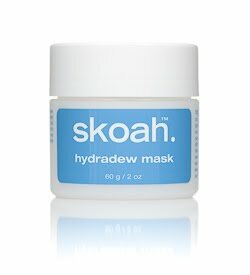 Last month I made an appointment with Skoah for my first facial ever and, on the recommendation of one of their skincare experts, purchased the Hydradew Mask ($40 Cdn). I'd been having problems with dry skin lately, and the Hydradew Mask promised to be an ultra-potent moisturizer. Its formula contains sea kelp algae and comfrey root extracts to replenish moisture and soothe skin without the use of oil or irritants. Use it 1-2 times a week, and the result is a taut hydrated complexion. Although the price is steep, the product is worth it based on my experiences so far. The mask is a gel-based formulation that felt cool and refreshing when I applied it, tingly to the touch but never irritating. The instructions said to apply it and leave it on for 15-20 minutes, then wash off what wasn't absorbed into the skin. However, I found that when applied as a thin layer all over the face, it absorbed completely and acted as an ultra-potent moisturizer. The effects lasted for days afterward. Given how long-lasting the results are and how little of the mask is required to achieve them, the seemingly small container can actually last months! To my Vancouver readers, have any of you tried Skoah's facials or products? What do you think of them? Mmmmm facial! That sounds so good! Hope you enjoyed yourself! The skin boost serum is UNBELIEVABLE!! And expensive!! But it makes your skin so soft and hydrated. I have yet to try any of their products even though their shop is almost across the street from my office. Will have to stop in sooner rather than later. I like how you use this as a moisturizer as well as a mask! It just makes a good product better by being so versatile! the facial sounds lovely. I haven't had the pleasure of getting one done at Skoah but hopefully some time in the near future! I could really used it haha. any way, I agree. steep price but totally worth it for what you're getting. it's a 2-in-1 product! and it works exactly the way it's supposed to and I love how soft my skin feels afterward. Not to mention that lovely fruity fresh smell! I also have their eye kandy eye cream, which is pricey but you get a lot so it'll will last a long time. I like it so far, it keeps my eye area well moisturized and prevent wrinkles (Not that i have to worry about that but it's never too early to start!) and I've also tried one of their facial moisturizers with SPF.. the pump dispenser is nice and the bottle size is convenient but I found the consistency of the cream to be too thick and the smell was just o-k. I prefer the smell of the hydradew mask more. I love Skoah products! I recently had my first facial there and am headed tomorrow for my next one. I LOVE all their products. I have been a long time Dermalogica user so I tested out a travel pack from Skoah, which is a sampling of some of their products. I fell in love with the smell and the fact that they were not irritating, althought the Face Skotion with SPF made me breakout. My next purchase is one of their Serums. great review. i had my 1st facial at Skoah recently when they had their patio glow special. the facial was probably too short for my liking (only 45 mins) but the results were pretty good. although my skin got slightly irritated in the days after. they gave me a sample of this tonic that's supposed to remove dead skin. I've used it a couple of times and it seems to work really well. i'm on the fence as to whether i'll go back there for another facial - might give them another try with a more customized treatment.